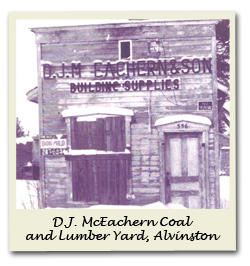 Alvinston owes its beginning to Archibald Gardner a Scotsman, who came to the area in 1835. Gardener had noticed that the settlers coming into the area had no means of grinding their grain into flour except by pounding it by hand. In 1837 he built a grist mill on the east bank of the Sydenham River on the hill that faces the present village. Gardner dammed the Sydenham River to provide power to run the two mill stones. It was the only grist-mill within a radius of fifty miles. Since horses were unavailable and oxen could not be readily guided through the bush, the settlers took their grain, or grist as they called it, to the mill in a bag strapped to their shoulders often carrying fifty or more pounds along a trail through swamps and bush. Later Gardner built a sawmill, making available to those in the area sawn lumber for their floors, doors and window frames instead of the split logs formerly used. Gardner had his mills only a few years when Mormon missionaries converted him to what came to be known as the Church of Jesus Christ of the Latter Day Saints. He was so enthused that he set out on foot and crossed the St. Clair River on floating ice to join Brigham Young, the Mormon leader, in Nauvoo, Illinois. Later in the year 1846, Gardner’s family and other converts abandoned their homes to go to Nauvoo by a chopped road through the bush to London Road. From there they followed Young to Salt Lake City. In 1946, one of the stones from Gardner’s mill was erected as a monument to them and Gardner beside the Nauvoo Road that they had made, now called highway seventy-nine. In 1846 the Gardner family sold his mill to the Branan family who came from the township of Metcalfe. The Branan’s Built a house in 1855 on top of the hill opposite the mill, as well as making improvements to the mill and adding more runs of stones. 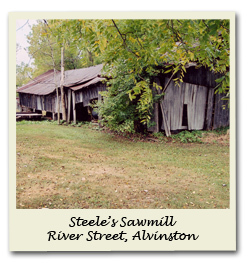 It continued to serve the Alvinston district until it was abandoned in 1874, though flour milling went on in the village until 1926. In 1854 the Hon. Malcolm Cameron, Post Master General of Canada, established a post office at the mill and appointed Mr. Branan to the position of postmaster. At the suggestion of Mrs. John McKeown, whose husband was the first clerk of Brooke Township, the office was named Alvinston, in honour of the village of Alverstone, on the Isle of Wight. The reason for the change of spelling is now not apparent. In 1854 mail came in once a week on horseback from Newbury to the south and Warwick to the north. A letter from Port Sarnia took at least three days to arrive. Alvinston was starting to grow, ten years after getting a post office, Alvinston was reported in a Lambton Gazetteer as having Branan’s grist mill, two hotels, one run by John Stanely and the other by William Branan, Ferguson’s blacksmith shop. With a population consisting only of the proprietors of the establishments and their families. It wasn’t until the Canadian Southern Railway came through Alvinston in 1872 that made the place really develop. Thomas H. White, of Vancouver a railroad builder with the Canadian Southern Railway together with Frank Finney saw what seemed a likely town site purchased the town site. Lots were sold in the London and Chatham papers. White’s one and only profitable real estate venture made $800. The town site is today Alvinston, Ontario. On June 12, 1880 Alvinston become an incorporated village. At that time Alvinston had two flour mills, one stove factory, one planning mill, one foundry, one cabinet factory, four wagon and blacksmith shops, two brick yards, ten stores, four hotels, one livery stable, one school of two rooms, five churches and a township hall.The new village began to experience traffic and financial problems. In 1886 the council passed a bylaw saying it was “not lawful for any person or persons driving a vehicle of any kind, drawn or by one or more horses, within the corporation of Alvinston to go faster than a slow trot, and not more than seven miles an hour.” After the closing of two private banks Fawcett’s in 1885 and John Conn and Company in 1892, the villagers lost savings and some businessman had to close up shop. Meanwhile the surrounding country became so productive that a second railway, the Grand Trunk, ran a line through Alvinston in 1892 to handle the abundance of farm produce and timber. Brooke farmers always took pride in their livestock, particularly their horses. As early as 1875, the Brooke and Alvinston Agricultural Society held ploughing matches and annual exhibitions of farm stock. In 1885 the society bought a 16 acre site known as the driving Park from the Alvinston Turf Association for $2600. This became the site for the Alvinston Fair which is held there every fall. As late as 1925 the bulk of traffic in and out of Alvinston was handled by rail making it less accessible than it is now. To reach the village from Corunna, for example, took about four hours by train. Rail traffic declined during the depression and after that roads and motor vehicles improved so that by the 1960’s Alvinston depended largely on cars and trucks for transportation. In 1960 the New York Central, the successor to the Michigan Central and Canadian Southern, ceased to run and the tracks were lifted in 1962. In 1965 the Canadian National Railway, which took over the Grand Trunk, stopped its freight service to Alvinston. A spirit of neighbourliness and friendliness has been a characteristic of Alvinston throughout the years, making it the wonderful village it has become today.